Snap-on cover for easy installation Designed specifically for the 2016 Samsung Galaxy J5 (with Model: SM-J510, SM-J510F, SM-J510FN) a.k.a Galaxy J5 6 ONLY. Will NOT fit the older Galaxy J5 (with Model: SM-J500 Series). TECHGEAR Fusion Armour protective Case is made of high quality materials to provide excellent grip and shock resistant properties. This case fits perfectly, allowing complete control of all the buttons. It’s made from a fusion of thermoplastic polyurethane [TPU] edges and hard polycarbonate [PC] back materials. Compatible with the 2016 Samsung Galaxy J5 (with Model: SM-J510, SM-J510F, SM-J510FN) a.k.a Galaxy J5 6 ONLY. Will NOT fit the older Galaxy J5 (with Model: SM-J500 Series). Allowing full access to touchscreen, cameras, buttons, and ports. High grade polycarbonate body with glossy finish (or frost effect depending on your choice of case) ; thermoplastic polyurethane bumper for great shock absorption and grip. Designed with both protection and looks in mind, It’s sleek design is still extremely light and durable giving fantastic protection against scratches and it also has great shock-proof capabilities if dropped. 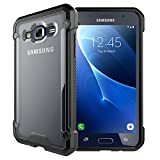 This entry was posted in Mobile Deals and tagged 2016, Armour, Bumper, Case, Frost/Black, FUSION, Galaxy, Hybrid, Premium, Protective, Samsung, series, Slim, SMJ510, TECHGEAR® by Cheap Monthly Mobile Phones. Bookmark the permalink.